There are shows across the country that are put on by Exposition companies, like the Edison Show and the Springfield Show. The differences between club shows and the professional shows are very obvious. It's like comparing a big supermarket to the corner store. Bigger layouts, grandiose displays, big name speakers, hundreds of dealers, and magazine style guidebooks, that you just will not find at a club sponsored show. 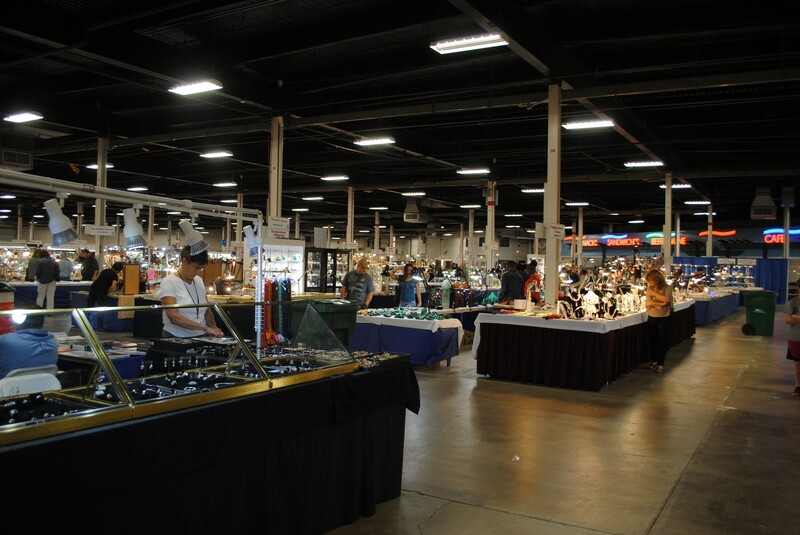 The Annual East Coast Gem, Mineral and Fossil Show in Springfield, Mass. is one such show, put on by Martin Zinn Expos. I attended on Sunday, August 11, with club members Ron Schulz and Jess Jacobsen. After a pleasant 3-hour drive, we walked in the door to find a spectacular display of world-class minerals from the Carolyn Manchester Collection. There were over 30 cases containing displays from her collection. 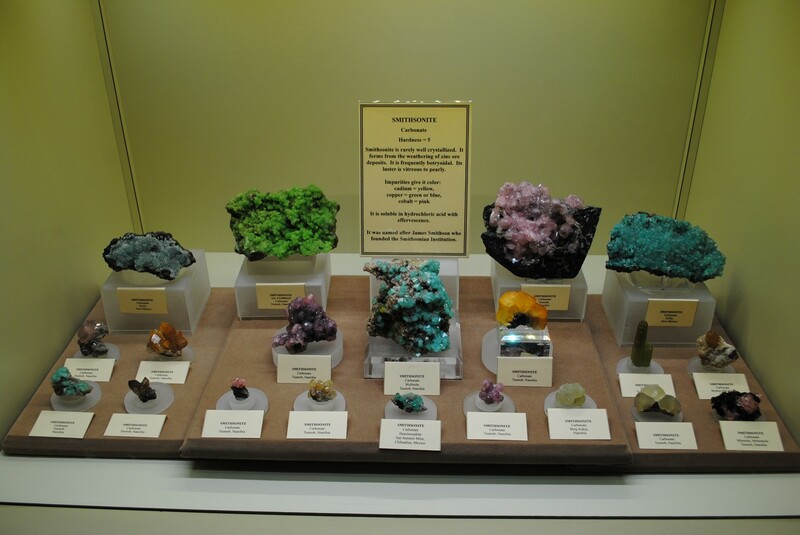 Carolyn is a retired school teacher, and has been collecting minerals for over 58 years, and the specimens presented for display were indeed stunning. Her collection consists of over 2000 hand-picked museum quality specimens from around the world. I have included some photos of the displays. Shortly thereafter, the first door prize of the day was announced, and was won by our own Jess! The show itself was well laid out, in neat rows, which made it easy to navigate and find dealers. 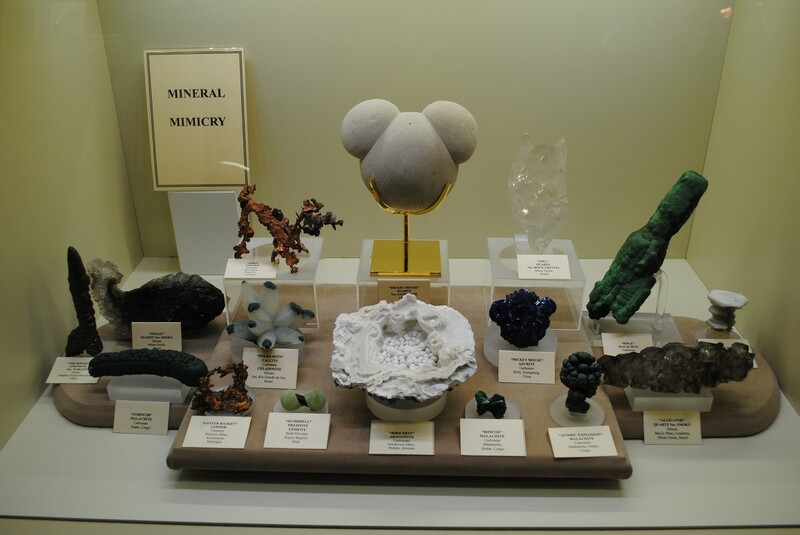 There were many fine mineral dealers who offered specimens I could only dream of. 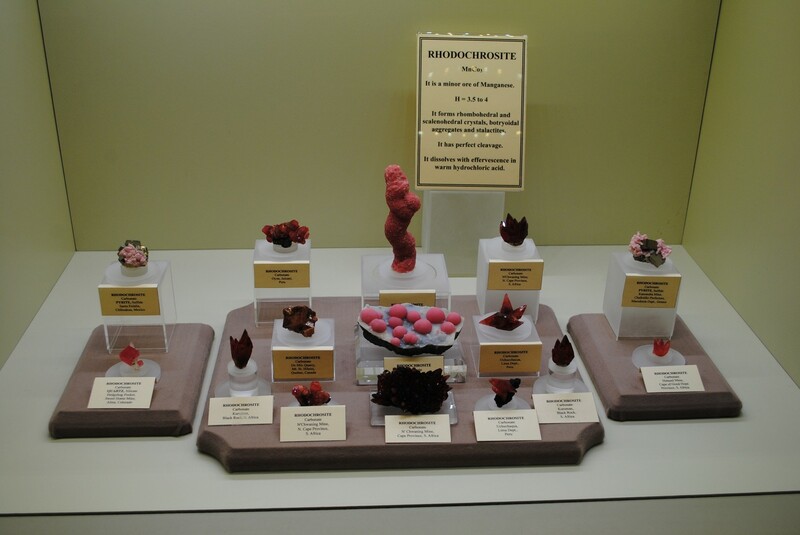 At some of the dealers, you would be hard pressed to find a mineral specimen priced under $500. But it was like walking through a huge museum, and that was worth the admission price. There were also several dealers featuring old books, mining artifacts, and relics from years past that were very interesting to browse. I did notice, however, an overabundance of bead dealers. Too many, to be honest. You had to walk past 2 or 3 bead dealers before you would find a true mineral dealer. This is one aspect I have been noticing more and more lately, and have been trying to avoid at our shows. I don't know if it's good or bad, but I don't want to see great rock, mineral and fossil shows transforming into bead and jewelry shows. Anyway, getting back on topic, many of our Clifton, N.J. Show dealers were set up at Springfield. There were great deals to be had as well. One such dealer that was offering good buys was our friend, Rocko, who was offering a large collection of Aquamarines at very reasonable prices. Another was the Herks.com booth, where they were offering superb quality Herkimer Diamonds at fair prices. Warren Gonzales was also making deals and had a large selection to choose from. There were a few other dealers who were offering up to 50% or more off quality pieces. So, there was truly something for everyone. There was also a large wholesale-only section, but we were not able to gain access because you needed a tax ID card to get in. By far, the most popular booth at the show was the Geode Cracking booth. The line was 20 deep all day long. The booth featured geodes from all over the world, which could be purchased and then cracked open on site. They had a large cracking machine which was going all day long. The kids especially enjoyed this feature. I mean, who doesn't like to see what's inside an unopened geode? There was also a sluice box where kids could pan for gemstones, but it did not seem to get much action during my visit. The show also offered lectures on all 3 days. On Sunday, 2 lectures were offered. The first was by Kevin Downey, all about cave exploration and cave minerals. 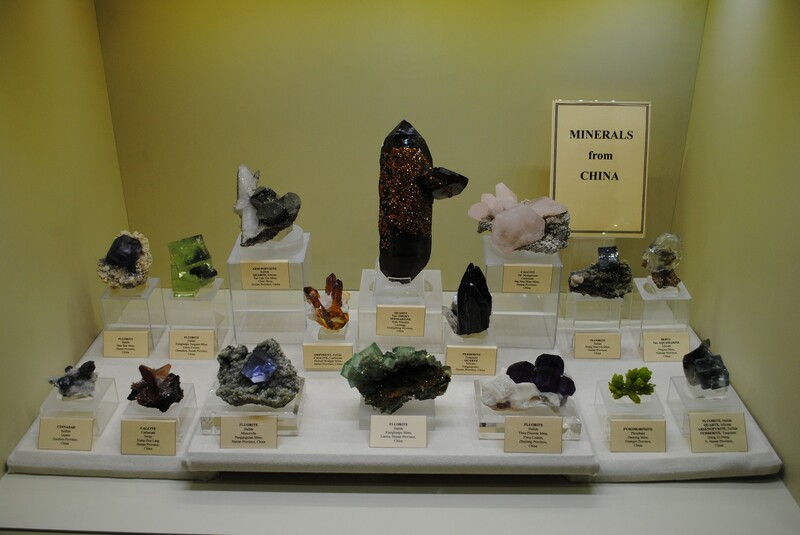 The second was by Bob Jones and was a discussion and slide show on the minerals of China. Overall, I enjoyed the show. I ran into many friends and fellow rockhounds. I got to speak to many of our Clifton dealers, and chat with a few prospective new dealers for us as well. It made for a very nice day trip, for sure. 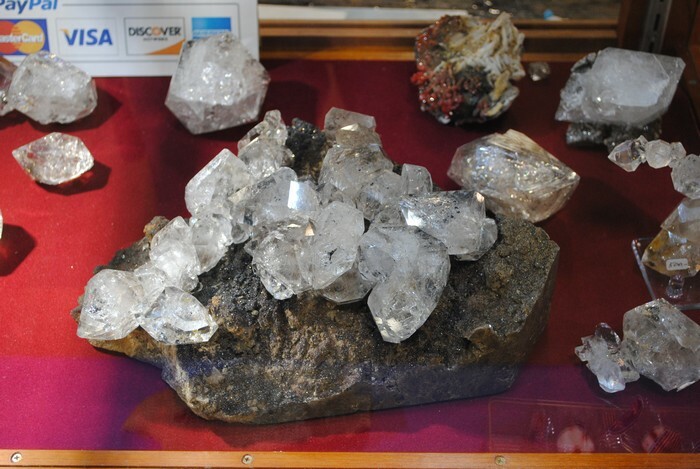 We have blasted our latest edition of the Minerals.net online newsletter. The article on "Mineral Labels" is listed in the previous news post. Most mineral specimens come with labels identifying them and their locality. They often have the original dealer or collector’s name on them as well. It is very important to keep all labels that come with a mineral, as one day they will likely be a historical addendum to the mineral itself. Occasionally you may encounter a classic mineral with several labels from different dealers and collectors that it had passed through. All of these labels add to the intrigue, authenticity, and value of the mineral. Even the price label on a mineral should be retained, so that the purchased value will have historical significance one day. It is always amusing seeing the low cost of an old mineral when it was originally for sale as compared to today. If a mineral lacks locality information, this will have a very serious negative impact on its value. When you purchase mineral specimens that are not labeled, make sure to ask the dealer to write you a label with the mineral name, locality, and the dealer name on it. This should always be kept in proximity to the mineral as a necessary accessory. The more information you can place on a label, the better. For example, useful fields include year collected, date purchased, collected by, original collection of, and so on. Often this information is not available, but if it is, it should definitely be documented. 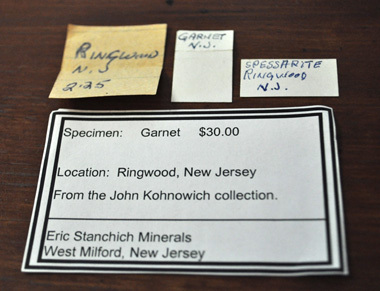 It is also good practice to write your own labels in addition to any existing labels you may have, so that future collectors will historically attribute the mineral to you. Many classic mineral specimens retain a higher value price when accompanied by an old label, especially when they are from a well-known collection.